A new liturgical year begins this coming Sunday, December 2, 2018, with the First Sunday of Advent. 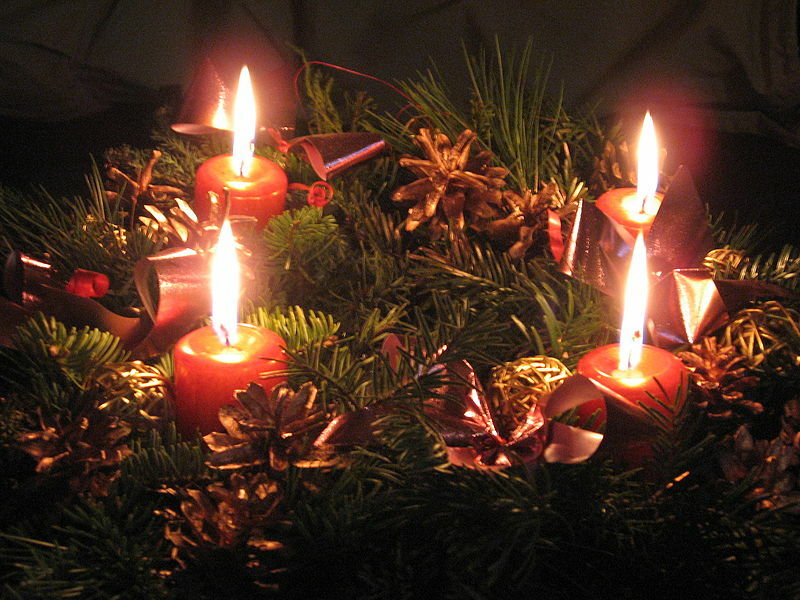 The Season of Advent consists of the four Sundays before Christmas. The liturgical color for Advent is purple or sometimes blue. We will begin a new liturgical cycle of seasons, feasts and fasts, and scripture lessons. This year the gospel will focus on Luke’s account with The Gospel According to John interspersed throughout the year but primarily in the Easter season. The liturgical cycle is not, however, simply about passing time. The liturgical cycle tells the story of God’s life in the world. But it is more than just reciting the story. We are participants in the story, not simply spectators or listeners. It is a ritual re-living of the life of Christ. Liturgy is the means by which we tell, live, and experience the story. It becomes real. It becomes our story not in the sense that we own it but in the sense that the liturgical cycle tells the story of our lives. That is hard work any time but especially in one of the busiest times of the year which may just mean it is even more necessary. Advent reminds us that waiting and watching are holy work. So how do we do this? Silence is the key. Silence is a way of waiting, a way of watching, and a way of listening to what is going on within and around us. We come to self-knowledge through stillness and silence, through attentiveness and watchfulness. So I wonder what we would discover if, for the Season of Advent, we took five minutes or maybe ten to just sit in silence and stillness, waiting and watching. What would the Coming One show us and say to us? WOW! this is what caught me… “liturgy is humanity’s yearning for God and grace is God’s yearning for humanity. Liturgically, this story of holy yearning—God’s and ours—begins…” Thank you! Thanks for reading my blog Diana. I think the yearning is also a call. God’s yearning call us out of ourselves, and our yearning calls God out of God’s self. We meet as the divine-human, the Christ. Mike, I am somewhat of a liturgy wonk and I, too, was struck by “…liturgy is humanity’s yearning for God and grace is God’s yearning for humanity…” I so enjoy your postings. Thanks for sharing them. Thank you so much Martha. It’s good to hear from you. I am sure I got that phrase from someone else, but cannot remember where or who. I love that God yearns for us. Mike, I am forwarding your message to our contemplative prayer and book study groups. Silence, always. And, as always, thank you. I am so glad to know you all are still meeting. That’s the yearning, right? Yours for God and god’s for you. We are hearing so much about The Story,which is fine, but for me the Story comes alive in living the liturgy, the work of the people. Thanks, Mike, and blessings yo you and yours. Yes, Ellen, the liturgy must be lived outside of the church walls. Until the Word becomes flesh The Story is just words on a page. Michael, “the time in which we are being prepared for Christmas.” Love it! That was my mother’s mantra during this season. She would tell us that all those people who decorated for Christmas immediately after the Thanksgiving desserts, saw December 25 as the end of the holidays. We see the Nativity as day one. Thanks for sharing! Hope you get a chance to read my Advent 1 post tomorrow. JBT, I appreciate your mother’s wisdom. Christmas is the beginning, a new with for us as much as Jesus’. I am glad to have found your blog. I enjoyed reading your blog post Michael. We have to make time and room for Jesus during Advent and all 365 days of the year! I invite you and your readers to begin an Advent Challenge with me on thewordsanctuary.blog. God bless you Michael! I hope you have a beautiful Advent season!